Pathways is a computer animation by new media artist Rob Gonsalves and traditional artist Anna Kristina Goransson. 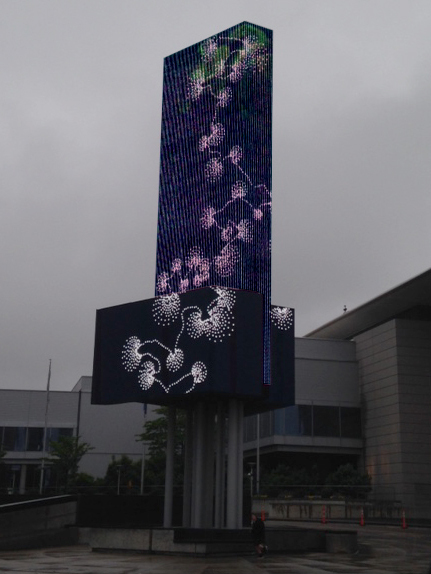 This is part of the Art on the Marquee project by Boston Cyberarts and the Massachusetts Convention Center Authority. Based on a pair of "awl punched paper" pieces by Anna Kristina, the animation shows a progression of falling motion revealing an organic pattern. This is followed by a rising motion revealing a second organic pattern. The series of punched holes is highlighted by orange swirls on the way down and green swirls on the way back up. Displayed against the Boston skyline, Rob's and Kristina's Pathways appears in all its sparkling beauty. The animation was created using openFrameworks, an open source C++ toolkit for creative coding. The colored swirls were created using an addon called ofxFlowTools by Matthias Oostrik.